Behind the classic good looks you'll find a modern, energy efficient heat storage range which is absolutely perfect for great cooking whilst gently warming your kitchen. It's so versatile and welcoming you'll wonder how you ever lived without one. Having been awarded the distinction of “Premier Dealer”, we are proud to list Everhot cookers amongst our growing portfolio of high quality range cookers. We currently have four Everhot cookers on show at our extensive Oxted Showroom, a Graphite 120i, a Black 100i, a Teal 90i and a Cream 60. We have a history of only dealing with the very best products in any given sector and Everhot lives up to our expectations completely. From the compact but highly capable 60 to the expansive 150i, there is an Everhot to suit any requirement. You will receive a warm welcome from our experienced staff who will be able to take you through all the aspects of each model within the Everhot range and advise you on the simple ordering and delivery process. We look forward to seeing you, please contact us with any questions you may have by email us or telephone. Please note; the Everhot model number correlates to the width of the cooker in millimetres. To celebrate their 40th Anniversary, Everhot have introduced a Metallic Range. Due to model specification changes, we are updating our Showroom Display Everhot, therefore we are offering our existing models for sale at a reduced price. Please see below models available and details. Please contact us for further details. The Everhot 60 fits neatly into a standard 600mm wide cooker space. With no flue or reinforced floor needed, installation is easy and non-disruptive. What's more, despite its compact proportions, it has spacious top and bottom ovens, four-saucepan hot and simmer plates and even an integral grill - a rare feature on equivalent ranges. This model requires the controls to be placed outside of the appliance, a cupboard alongside the cooker being the usual choice. Being so compact you might expect some compromise, but nothing could be further from the truth. Yes it is small, but it’s also perfectly formed. The Everhot 90+ is designed for people who like the look and feel of a traditional standard sized range. It is the ideal solution if an old range has been removed as many were built to this size. In addition to its traditional appeal and versatility the 90+ features a separate simmer plate conveniently located under a second stainless steel lid. In this model the controls are integrally mounted behind their own cast iron door, beside the top oven. The 90i substitutes the separate simmer plate with a 2 zone induction hob. The induction hob offers you a fantastic solution for those summer days when you simply don't want heat in the kitchen and induction is unrivalled in terms of control, speed and efficiency. 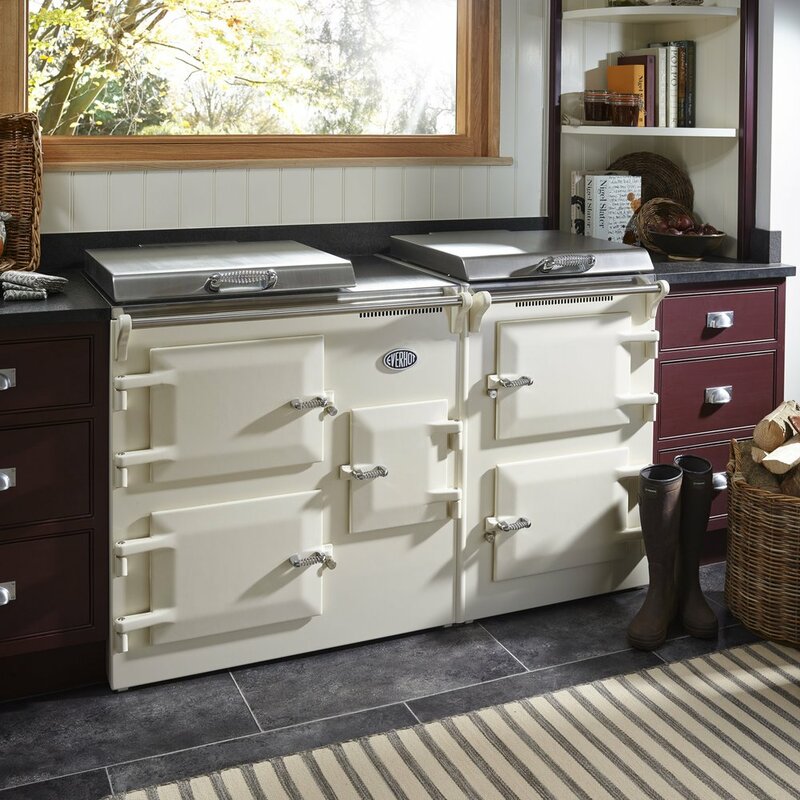 The Everhot 100 has all the traditional style of a classic range cooker. Its four cast iron doors provide a beautifully balanced appliance which forms the centrepiece of any kitchen. Behind the doors lie three ovens, on the left hand side roasting and casserrole ovens, whilst behind the third lies a useful plate - warming oven. The final door conceals all the controls necessary to run the cooker. You also have the choice of some extra magic with the Everhot 100's hotplates. The 100+ benefits from a separate simmer plate as with the 90+ above. The 100i incorporates, the ultimate in cooking technology - a commercial quality Dual Zone induction hob - which is able to provide flexibility, additional capacity throughout the year and can be used instead of the traditional hotplates in hot weather. The EVH110i is the latest addition to the Everhot range of cookers, it provides all of the oven space of our bigger cookers but is designed to fit into a slightly smaller space. Behind its four cast iron doors lies three full size controllable ovens whilst the fourth conceals the control box which allows you to adjust all the cooking temperatures to your own specific requirements. The ovens are envisaged being used for roasting, casserole or plate warming, however the ovens are equally at home in the classic configuration of roasting, baking and casserole - one of the beauties of the Everhot is that you can simply set it to a temperature that suits you and your style of cooking. Of course, should you not need the capacity or heat from the ovens then it is very simple to just turn off what is not required. Once again the EVH110i offers a fascinating hybrid of classic cast iron hotplate cooking, whilst providing the latest in induction technology with its large, commercial quality induction hob - ideal to increase the overall hotplate space or to provide a useful facility during the summer months. The Everhot 110+ offers the classic configuration of boil and simmer plates under separate lids; both of which are independently controllable. In addition, this cooker has three ovens; ideal for those customers who want to have a roasting, baking and casserole set up. The fourth door provides access to the controls of the cooker. The Everhot 120 lets you enjoy the luxury of four ovens and four hotplates - each being independently adjustable for maximum versatility. So you can have cakes in one oven, the roast vegtables in another, a joint in the third, plates warming in the fourth - all at different temperatures. On the hotplates, a sauce simmering gently, peas boiling on another and loads more hotplate space to spare. As with the 60, the control boxes can be conveniently situated in adjacent kitchen units (or on the worktop). The Everhot 120i has all the traditional style of a classic range cooker, its four cast iron doors provide a beautifully balanced appliance which forms the centrepiece of any kitchen. However, behind these doors lie three ovens, on the left hand side roasting and casserole ovens, whilst behind the third lies a useful additional oven for when you have a house full. With the 120i the final door conceals all the controls necessary to run the cooker. In addition to the classic cast iron hotplates, the 120i incorporates a fantastic three-zone induction hob, perfect for hot summer days or to augment the overall cooking area. The versatility of the 120 is brilliantly extended by the Everhot 150, coming as it does with integral controls and a useful resting plate positioned between the hotplates. This is an impressive cooking range in every sense and would not look out of place in the grandest of kitchens. Able to suit the needs of a large family , especially if you're fond of entertaining, the 150 is a cooker that will definitely fit the bill. Unlike its contemporaries, when all four ovens (and their associated heat) are not required it is simply a matter of turning off parts to suit your cooking or heating requirments. Offering the height of technology whilst retaining the classic design, our new 150i has three independently controllable ovens, two cast iron hotplates, a useful plate warmer, and a three-zone induction hob. The controls for the 150i hide neatly behind the centre door, whilst a touch-screen induction hob is revealed underneath the right hand lid. This range delivers real presence into your kitchen and its combination of traditional cast iron hotplate and high-tech induction is currently unique. The state-of-of-the-art induction hob matches all our requirements for both reliability and performance. The Everhot is a true heat storage range, designed to provide both cooking and room heat. Allowing the control and versatility of modern cooking methods, together with the even baking and winter warmth of the traditional range. Aubergine, Black, Blue,Burgundy, Cream, Dove Grey, Fern Green, Graphite, Green, Marine Blue, Sage, Teal, Victoria Blue, White, Tangerine, Dusty Pink, Stainless Steel, Mustard. Blades Heating Ltd, 2A Amy Road, Oxted, Surrey, RH8 0PX.